Surely a must-cop for Antonio Brown. 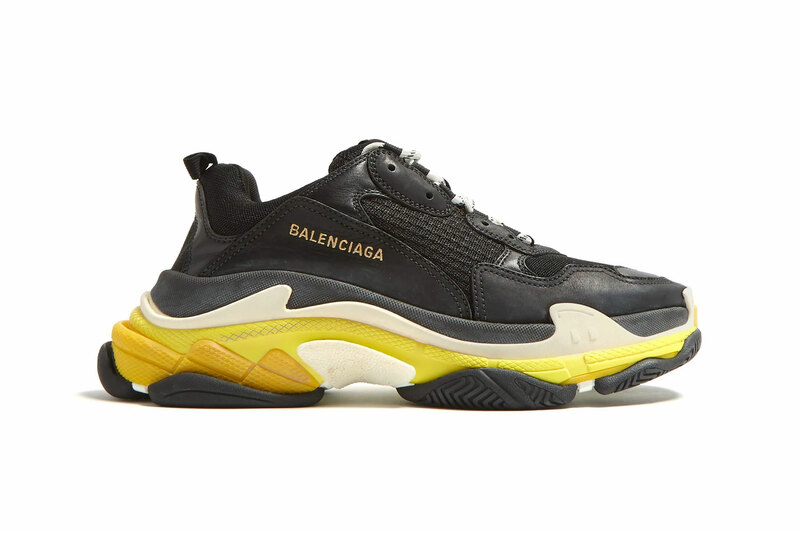 Balenciaga’s Triple S Trainer continues its year long run atop the ever-popular chunky sneaker trend with a new, versatile color combo of black and yellow. The majority of the sneaker comes constructed in black supple leather and mesh with a contrasting yellow slicing through the enlarged midsole. The rest of this iteration carries on with the model’s original design, including speckled laces, sizing designation at the toe and Balenciaga branding on each lateral side. The Balenciaga Triple S Trainer “Black/Yellow” is currently available at select stockists, such as MATCHESFASHION for $930 USD. Those who aren’t fans of this contrasting mix can peep these tonal Triple S Trainers with translucent soles. Designer of Balenciaga’s Triple S Launches Line of Elevated Sneakers, "Shoes 53045"
Introducing a wide range of products from dental to shaving. Sizes are selling out fast. How the artist went from sticker bombing to fine art painting at the World Trade Center. The up-and-comer serves up nine new tracks. Appropriately starring Sanji and Smoker. Alongside a new redesign for the fusion.